Thieves Tarot - You Are A Member! Meditate on your shadows, members. And who better to help fathom those depths, other than Punxsuawney Phil and Carl Jung, than thieves. From the moment we steal life from our mothers until the instant death steals it from us, we live a lifetime of thievery. Most of us go the socially acceptable route, denying our thieving natures, conforming to the rule of law and relegating our theft to existentials like time or ephemera like office supplies. But others–thieves of the self-proclaimed ilk or just the good old-fashioned convicted kind–take on thievery as a vocation, knife fights and all. In doing so, thieves refuse to repress what is basic to our nature: taking. As avatars for for a fundemental concept of being, thieves remind us of that which lurks beneath the veneer of order. 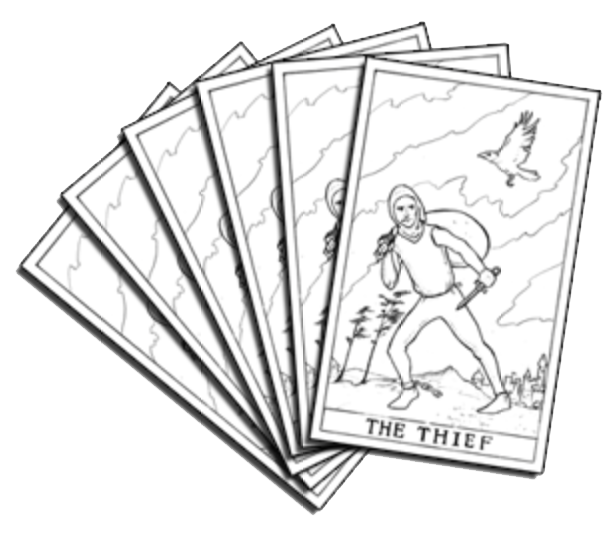 Hence, the Thieves Tarot. Take a card from the deck with a mouse click and let the Tarot divine what thievery you may be perpetrating—or denying.